No contemporary filmmaker has chronicled the messy human experience with the eye and ear of a comedic cultural anthropologist like Judd Apatow. Hits as varied as those he’s directed, like Knocked Up and The 40-Year-Old Virgin, and those he’s produce. No contemporary filmmaker has chronicled the messy human experience with the eye and ear of a comedic cultural anthropologist like Judd Apatow. Hits as varied as those he’s directed, like Knocked Up and The 40-Year-Old Virgin, and those he’s produced, like Superbad and Bridesmaids, are all unified by their honest, unflinching, comic look at how complicated it is to grow up in the modern world. Since she was a little girl, it’s been drilled into Amy’s (Schumer) head by her rascal of a dad (Colin Quinn) that monogamy isn’t realistic. Now a magazine writer, Amy lives by that credo—enjoying what she feels is an uninhibited life free from stifling, boring romantic commitment—but in actuality, she’s kind of in a rut. When she finds herself starting to fall for the subject of the new article she’s writing, a charming and successful sports doctor named Aaron Conners (Bill Hader), Amy starts to wonder if other grown-ups, including this guy who really seems to like her, might be on to something.d, like Superbad and Bridesmaids, are all unified by their honest, unflinching, comic look at how complicated it is to grow up in the modern world. Download Trainwreck in Digital HD from the iTunes store. Trainwreck images are © Universal Pictures. All Rights Reserved. 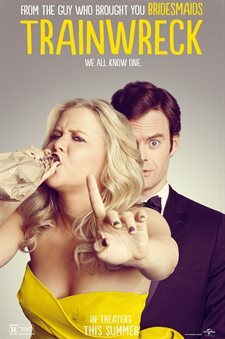 Amy Schumer (Inside Amy Schumer) walks into a bar, drinks too much, picks up some random guy, and writes a script about it. Welcome to the world of Trainwreck. The hilarious comedy written by and starring Schumer that comes to theaters on July 17th. From a young age, Amy is indoctrinated by her cheating father (Colin Quinn; Saturday Night Live) that monogamy is a bad thing. She has avoided emotional intimacy her whole life, opting for a string of meaningless one night stands instead. It seems to have worked for her so far. Amy drinks too much, smokes weed regularly, writes for a vulgar men's magazine, and has never had a long lasting relationship. In fact, she purposely avoids them and thinks less of anyone who embraces the long held tradition of marriage and family, including her own sister, Kim (Brie Larson; 21 Jump Street). When Amy, who despises sports, is asked to write an article about prominent sports physician, Aaron Conners (Bill Hader; Inside Out), she finds herself falling for the awkward, funny, sweet doctor. Recognizing she is in love with him, she is determined to sabotage the whole relationship, rather than face her fears. It is only after she loses her dad, Aaron and her job that she is forced to re-evaluate her life and her relationship philosophy. In true Hollywood fashion, she cleans herself up, grows up and does her best to win Aaron back. While Schumer and Hader are great, the supporting cast brings the film to another level. Tilda Swinton (Michael Clayton) is fantastic as Amy's boss Dianna, playing a more lighthearted character than we normally see from her. Quinn does a great job keeping up with Schumer as her insulting, rough around the edges; say it like it is father. John Cena (Fred: The Movie) adds a softer element as Amy's most likely gay, part time boyfriend (before she meets Aaron). Surprisingly, LeBron James add some truly comedic moments to the film, especially when he recites Kanye West's Gold Digger lyrics to Aaron. The film starts out promising to be something a little different but ends up mostly being a romantic comedy with some crude humor thrown in. It seems to be emulating Bridesmaids or Ted for the over the top insulting and disgusting humor but doesn't quite reach the same level as those films. Most audiences will enjoy it, though, and laugh from start to finish. I'm the odd man out; while I laughed at certain moments, I didn't find the film as funny as everyone else. I also found myself distracted by the unusually short length of most of Amy's skirts and dresses which annoyed me the entire 2 hour running time. Schumer proves why she was nominated for a Prime Time Emmy for writing. The script is sharp and funny with a touch of the human element thrown in. Judd Apatow (Knocked Up) also does his usual fine job as director. #contest my date had such a bad breath that I had to ask her to never call me again and to please lose my number. #Contest During our movie, my date pulled up her skirt and said "well? Better hop to it." #contest My worst dating disaster- my date from am online website. He revealed on our first and last date all about his debt, debt collectors harassing him, his therapist, his cat, his ex and his church he described as a cult. Anyone see the movie yey?